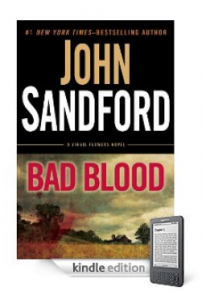 A friend recommended that I review John Sandford, writer of popular thrillers such as Bad Blood and Storm Prey. This is good timing to write about thrillers with it being Halloween and all. The hardback version of his latest books are almost three times as much as the Kindle version. So by going with the Kindle or Kindle DX version, you will be getting a really good deal. Bad Blood is the fourth book that features Virgil Flowers, a Minnesota Criminal Bureau agent. Bob Tripp “accidentally” murders Jacob Flood by hitting him in the head with a T-ball bat. I cracked up when I read about that. How can you get killed by a T-ball bat? The plot twists when Virgil Flowers and Sheriff Lee Coakley, investigate the crime after Tripp is found hanging in his jail cell. There is evidence of a romantic spark between Coakley and Flowers, but the primary focus of the book is the investigation. They investigate Jim Crocker, the deputy on duty when Tripp kills himself. The pair uncover a multitude of murders and sexual abuse cases that implicate both a strange church and within the police force. Amazing how one simple murder case has led to a chain of much more sinister criminal activities. The reviews of Bad Blood are great overall. Many of the reviewers said that this is the best book in the Virgil Flowers series. Other books in this series that are worth checking out are: Rough Country, Heat Lightning and Dark of the Moon. Sandford’s Storm Prey features the investigation of a robbery turned murder that is investigated by Minnesota Bureau of Investigation Lucas Davenport. A group of idiots try to rob a pharmacy so they can turn around and sell the drugs for a large sum. The robbery turns into a murder when they accidentally kill the pharmacist. So, like Bad Blood, the bad guys are really dumb and the good guys have brains. The plot also involves Lucas’s wife who at the time of the robbery was in the middle of operating on a set of conjoined twins. The gang associated with the robbery attempt to take her life as well as their own members. So Storm Prey has a similar “one simple murder case sets off a chain reaction” type plot that Bad Blood does. One reviewer describes the Davenport series as “a marathon rather than a sprint.” The series describes the investigation in detail without it being a “hold your breath, don’t know what’s next” type thing. Virgil Flowers makes an appearance and there are referrals to the series’ earlier and much darker novels. The reviews were good overall. Some mentioned that Sandford’s book is a bit repetitive plot wise. I guess this is a common occurrence with any author. As you read more and more of their books, you can really see what structure they use. That can come off as nice and familiar, or boring. The Kindle version of Storm Prey is pretty expensive. If you want something cheaper, check out his earlier novels in the Davenport series such as Wicked Prey or Invisible Prey. This entry was posted in Good Kindle Books At A Glance, Kindle Books and tagged Bad Blood, crime, Dark of the Moon, Heat Lightning, John Sandford, Rough Country, Storm Prey, thriller, Wicked Prey by holly. Bookmark the permalink. We are a group of volunteers and starting a new scheme in our community. Your website offered us with helpful information to work on. You’ve performed a formidable job and our entire group shall be thankful to you.